Seeing the wood for the trees can sometimes be hard. When events are changing by the hour, and the issues involved are inherently complex, getting an overview of what's going on is difficult. Brexit is a case in point. Multiple newspaper articles almost every day. 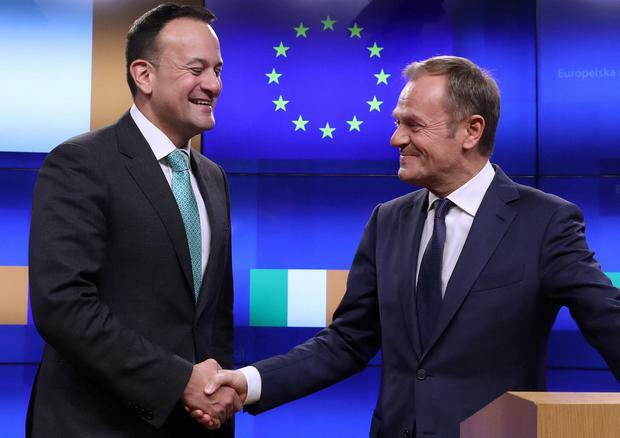 Hourly news broadcasts with the latest from the Taoiseach, the Tánaiste, Theresa May, Michel Barnier, Donald Tusk and a cast of dozens more. Endless conversations in homes, places of work and pubs on what it all means. Nobody can be sure what will happen at the end of next month, when the UK is scheduled to leave the EU. Anyone who says they know how Brexit will unfold is talking through their hat. Events are out of control. With that in mind, and stepping back from the blizzard of Brexit news, what is really important about what we know so far? The impact of Brexit since the UK referendum in the middle of 2016 had been surprisingly - and pleasantly - limited. The wider European economy has suffered no discernible ill-effects. Economic growth accelerated in 2017. It has slowed since - and come to a halt in some continental countries - but that has nothing to do with Brexit. Ireland has not been quite so fortunate, even if the negative effects have been small so far, and they have been offset by the benefits of more foreign investment and lower consumer prices. Those lower prices are thanks to sterling falling before and after the referendum. That meant that buying British goods became cheaper. This is one of the reasons for Ireland's ultra-low inflation rates in recent years. There were also negative consequences for Ireland because of a weak British currency - such are the swings and roundabouts of currency fluctuations. Sterling fell in value vis-a-vis the euro, which made visiting Ireland more expensive for visitors using that currency. It also caused Irish goods and services to become less competitive in the British market. But the impact overall has been small, if not negligible, mainly because the domestic economy is growing so strongly and other markets are doing well. In tourism, for instance, the fall in the number of Britons coming to visit has been a fraction of the increase in arrivals from the rest of the world - last year, total visitor numbers surpassed the 10 million threshold for the first time ever and the industry continues to go from strength to strength. The performance of the UK economy since June 2016 has also been surprisingly resilient, as evidenced by an unemployment rate which remains at lows not seen in decades. British consumers lost out as higher import prices eroded wages and salaries (again, the result of a weak exchange rate). But businesses did not suddenly stop investing in response to uncertainty following the referendum, something which surprised most economists, including this one. If the British economy is heading for a Brexit slump, it is at least starting from a good place. How bad could a no deal be? For the UK suddenly to exit the market with which it has become deeply and intimately connected over almost half a century would be a change without precedent. Nobody can predict exactly how disruptive it would be, but a no-deal Brexit would be negative for the British economy. The only question is how negative? Would it cause a mild slump or a deep and protracted recession? The answer, in my view, is on the bad end of the spectrum of possible outcomes. For Ireland, the negative effects of a no-deal Brexit are more likely to be greater than for Britain, for a number of reasons. First, Irish goods exports to the UK relative to the size of the Irish economy are greater than UK exports to all EU members relative to the size of the UK economy. Second, Ireland is more than three times more dependent on trade with the rest of the world than the UK. Much of Ireland's goods trade - both imports and exports - to the rest of the world transits via the British 'landbridge'. These flows of goods across the island of Britain would face disruption in the event of a no-deal exit. A third reason relates to policing borders. In order to minimise disruption and shortages in the initial period after March 29, the British intend to impose no new checks or tariffs on goods imported from the EU, even if the EU puts those same barriers on British goods. Contrary to a lot of ill-informed talk about Britain's obligations under the World Trade Organisation, there will be no issue with this, at least in the short-run. Ireland, by contrast, will have to go along with what is collectively agreed with all other 26 remaining EU member countries. If the EU treats the UK as it does countries with which it has no trade deals from March 30, then Ireland will have to collect taxes on imports from the UK and radically ramp up customs inspections. This could cause shortages of some foodstuffs and of materials that keep Irish production lines rolling. In the summer and autumn of 2017, frustration in Dublin, Brussels and other EU capitals with the British government's unclear approach to the exit negotiations became intense. With an agreed deadline for the end of the first phase of the talks looming in December 2017, the Irish and EU side - quite out of the blue - put a dramatic demand on the table. London would have to agree that there could be absolutely no change to the Border on Ireland under any circumstances. If Britain wanted any longer-term arrangement with the EU that made this impossible, Northern Ireland would have to remain in the EU's customs union and single market. It will probably only be when politicians and officials write their memoirs in the distant future that the full story of how the backstop originated emerges in public, but 15 months on from its appearance, and just over 50 days until the UK leaves, it has dominated Brexit ever since. For both sides, it has become totemic. It is now a test of strength. Language on both sides has become almost war-like. With so little room to fudge the binary choice between a meaningful backstop and no meaningful backstop, the two sides have painted themselves into their respective corners. That is not a good place to be just weeks from an event that could cause huge damage to the lives of so many people. This is an abridged version of a talk Dan O'Brien gave this week to launch the Institute of International and European Affairs' countdown to Brexit series of events. Eoghan Harris Lyra McKee will not have died in vain if it shocks Irish nationalism, north and south, into resetting its moral compass. Edward McCann They were shots that echoed around the country - plunging Northern Ireland once more into tortured self-analysis after tragically and pointlessly taking the life of a talented young journalist.